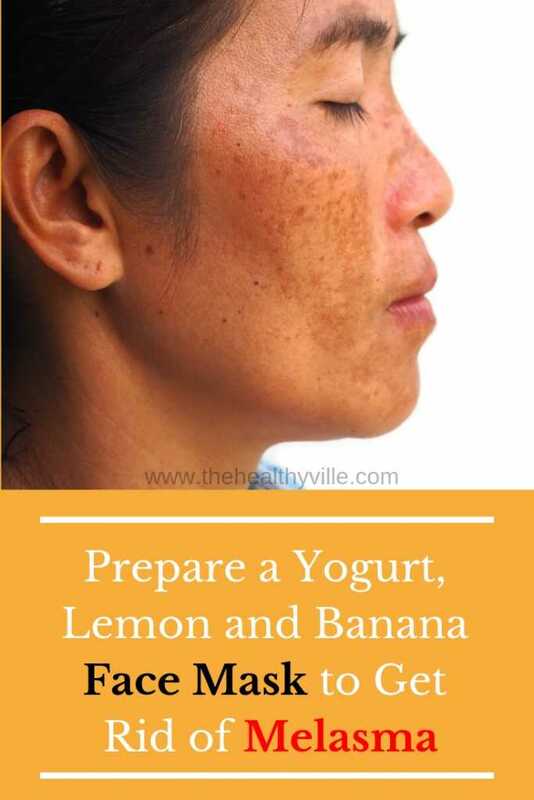 See how to prepare a yogurt, lemon and banana face mask that will help you treat and reduce the melasma on your face. You have noticed dark spots on your face and you do not know how to clarify them? These spots could be a melasma. There are some creams on the market to treat it, but here we will tell you a natural yogurt, lemon and banana face mask treatment to fight melasma. Dermatological treatments are usually quite expensive. However, with this natural alternative you will only need to go to the supermarket and look for these three ingredients at a low cost. What is melasma and what are its causes? Melasma is a hyperpigmentation of the skin of the face. It appears in the form of brown or dark brown spots on the forehead, cheeks, chin or even on the neck. Its appearance is greater in women than in men. The reason for this is that the increase in female hormones causes, in turn, the increase in melanin and, therefore, the appearance of melasma. The origin of melasma is not yet clear. However, it usually appears after constant exposure to the sun without the use of sunscreen. Genetic factors are also among the causes, as is the irregular presence of female hormones. Because of this, the appearance of melasma in pregnant women is common. The use of oral contraceptives and hormonal treatments with progesterone and estrogens also contribute to the appearance of melasma. Thus, these are also presumed as possible causes. What are the benefits of yogurt, banana and lemon for the skin? Yogurt is an excellent natural ingredient to hydrate the skin, exfoliate it and fight acne. This is due to its high content of zinc, lactic acid, calcium and to have an acidic pH. The banana has beneficial nutrients for the skin such as manganese and vitamins B6, C and E. In addition, it has antioxidant properties and a large amount of water, which makes it an excellent moisturizer for the skin. Lemon is a citrus rich in vitamin C. Helps to eliminate dead skin cells, accelerates cell regeneration, stimulates the production of collagen and eliminates skin spots. All this makes yogurt, banana and lemon ideal ingredients to make a natural remedy to mitigate melasma. Do you want to know how it is done? Take note! Peel the banana, add it to a bowl and crush it very well until you get a puree. Add the 2 tablespoons of plain yogurt and mix until it has a creamy and homogeneous consistency. Finally add the lemon juice and mix again. If you are using a treatment to fight melasma, do not forget to use sunscreen. Let it act for 20 minutes and then wash your face well. It is recommended to apply it at night. Read more: Banana Peel Uses And Reasons Why You Should Never Throw Them Again! It is important that after the application of the treatment you do not expose yourself to sunlight due to the acidity of the lemon. If your skin has traces of lemon and you expose it to the sun, it will generate a chemical reaction that could burn the treated area. Therefore, it is very important to wash the face with plenty of water and not exceed the recommended time with the preparation on the area. The most important thing is to have healthy skin and not mistreat it. Also, after using it, you should apply a moisturizer or sunscreen if you leave the house. Your skin will be more sensitive and although you have washed it well and there are no traces of lemon, you should still protect it. It is recommended to use of this treatment i3 times a day, for 2 or 3 weeks to treat the melasma. Remember that as soon as you see dark spots on your face and suspect that it is melasma, you should go to a dermatologist. They will tell you if you’re suffering from this skin disorder. For this diagnosis the doctor will use an implement known as Wood’s lamp. By illuminating your skin with this special light you can easily determine the presence of melasma. If you are pregnant, multiply the care of your skin. Do not leave home without first having applied a generous amount of sunscreen. In doing so, remember to put special emphasis on your face. Don’t forget to SHARE the yogurt, lemon and banana face mask with your family and friends on your social networks.